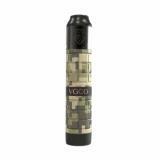 VGOD PRO Mech 2 Kit with Elite RDA, which comes with 2ml liquid capacity, is powered by single battery. VGOD PRO Mech 2 Kit with Elite RDA, which is powered by single 18650 battery, adopts high quality material to ensure long service time and up-scale texture. 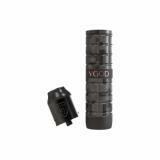 In addition, the tank that has 2ml liquid capacity comes with dual posts with 2mm hole and 9.25mm deep juice well. Please don't miss this tank. Just take it to enjoy perfect vaping. • Three-month warranty for Mech 2 Mod and Elite RDA. • Quick link: Elite RDA. Very nice and all. But as you can see in the 35th photo. Golisi 21700 batteries don't give him. They don't fit q mal T-T i think q would only be used with 18650 and 20700 nothing else i think.